I’ve been told that this isn’t really a goulash recipe, but since that’s what my husband called it, that’s what I’m going to call it as well. This was a two-pot dinner… one medium pot for the pasta and one large skillet to brown the meat and mix everything together. Simple and comforting… that’s what I was craving last week when the snow hit our area. I started by dicing together a large onion and half a large green pepper and sautéing them together in a pat of butter. Once the vegetables were browned, I added a package of ground turkey and cooked this until the meat was thoroughly browned. To this mixture, I added a healthy pour of a dark Petit Verdot and cooked the meat mixture until the wine had been thoroughly absorbed. The last “flavor addition” was a can of petit diced tomatoes, which added some great color to the dish. While I was cooking the meat, I started cooking a pot of water with jumbo elbow macaroni and salt. Once the pasta was cooked, I drained it and added it into the large skillet and stirred everything together, seasoning with garlic, salt, pepper, and paprika. This recipe is very similar to the mazetti that my mother-in-law makes (which is absolutely delicious) and was a huge hit with my family. The flavors melded together nicely and the dish was hearty enough to be filling without adding bread on the side. A simple green salad would have been a nice addition, but not totally necessary. Enjoy playing with this recipe if you choose to make it for your family. A wonderful Hungarian smoked paprika would be fabulous – Think I might be able to talk my local grocer into stocking this spice if I whine about it enough? 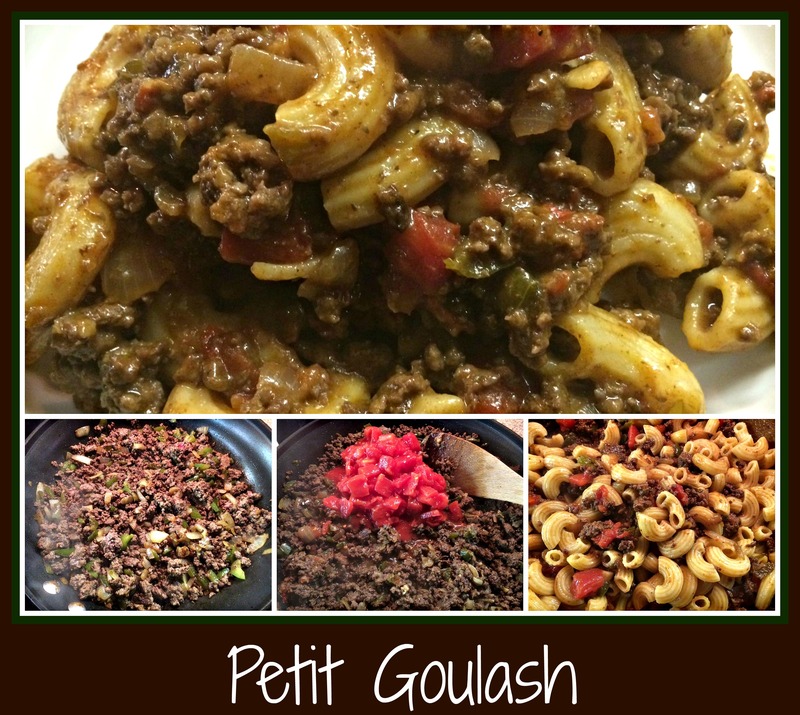 Have fun making your own family’s favorite “goulash”… after all, you’re creating something for those you love. What could be wrong about that? Enjoy!